WASILLA — As emergency rooms from Juneau to Fairbanks grapple with a surge of patients with mental health issues, the only hospital in Mat-Su just downsized a new psychiatric unit — to get it open sooner. Mat-Su Regional Medical Center along the Parks Highway near Wasilla originally planned a more than $19 million, 36-bed behavioral health facility connected to the emergency department. The new building slated to open in December 2020 represented the first-ever emergency mental health beds for an area the size of West Virginia with a still-growing population of more than 100,000. Now work is starting next month on a much smaller — and less costly — $4.5 million psychiatric wing inside the hospital with 16 beds scheduled to open this summer. It’s unclear whether the hospital will go ahead with the larger facility in the future. Hospital administrators say starting with fewer beds allows them to bring services to an underserved community that can’t wait two years. “We strongly felt we had to do something much more quickly than that,” said Hope Allison, the hospital’s new — and first — behavioral health director. The Matanuska-Susitna Borough is the state’s fastest-growing area, located about an hour north of Anchorage but with fewer mental health services than are offered in the larger city. And like hospitals across the state, Mat-Su Regional Medical Center is seeing a surge of patients show up in the emergency department with mental health issues or substance use disorders due to the lack of beds at the state’s only state-run psychiatric hospital, Alaska Psychiatric Institute, now facing privatization amid continued problems. Hospital administrators across the state describe a mental health “crisis” spurred by overcrowding at API — the state this month announced a transition to for-profit administration — as well as opioid and other drug and alcohol addictions adding additional pressure. Fairbanks Memorial Hospital in January announced it was remodeling its emergency room to expand mental health services. Scrambling to find acute, inpatient behavioral health beds, Mat-Su Regional actually sends more patients to a psychiatric unit in Juneau than to Anchorage, officials say. As many as a dozen patients a day wait for transfer to a facility that can provide specialized, secure care. At least one patient waited two weeks. 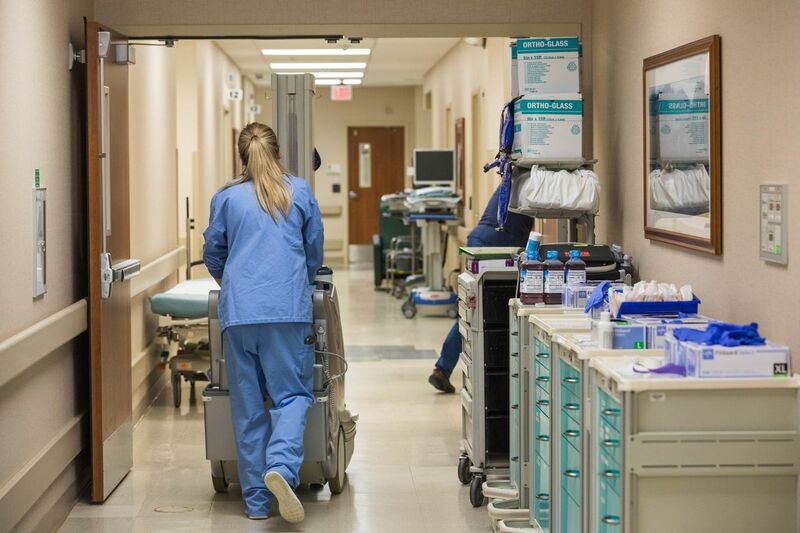 It might seem surprising, then, to curtail plans for a larger facility in Mat-Su given an overloaded system that led hospital administrators to set aside four emergency rooms for patients who might be a danger to themselves or others. But people on the front lines of mental health and addiction battles here praise the speedy addition of any new beds. “The idea they could bring psychiatric beds online much faster, even though it was at a reduced number, is something that is very welcome to us,” said Kevin Munson, CEO for Mat-Su Health Services Inc., which conducts patient evaluations in the hospital emergency department. The community health center provided 133 percent more evaluations in 2018 than the year before, Munson said. He described patients waiting in the ER for days. The statewide lack of psychiatric hospital beds is exacerbated in Mat-Su by population growth, advocates say. Residents here need local behavioral health beds that provide immediate care as well as access to local support networks: Patients getting referrals in Anchorage for Mat-Su services don’t always follow through the way they might if the next appointment were immediate and nearby. “The reality is that the Valley has grown so phenomenally that the pressure for this kind of service has been there, it’s been kind of an unmet need, for decades,” Munson said. 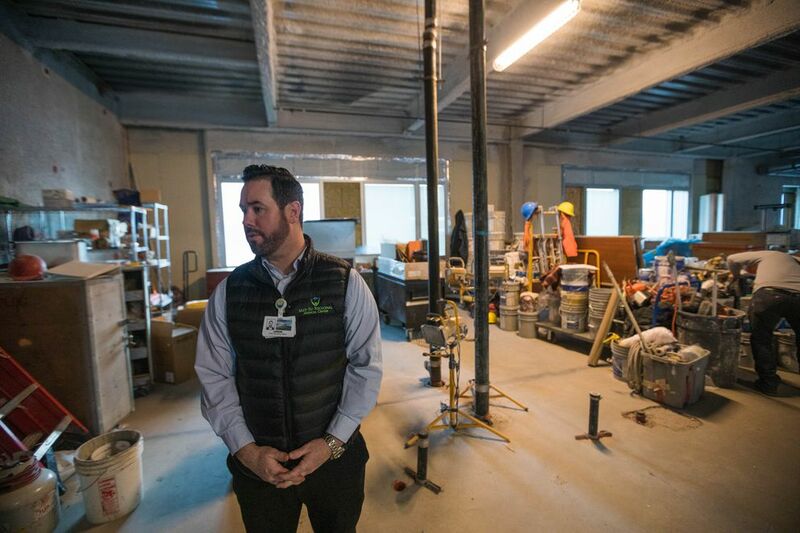 The new unit is under construction on the hospital’s third floor in a wing separate from a $12 million expansion of 35 new single rooms — in addition to 74 existing beds — expected to open in coming weeks. A recent unveiling for the Greater Wasilla Chamber of Commerce had to be postponed as work continued. Combined with a recently completed medical office plaza, the hospital expansion represents the largest investment in health-care facilities in the area since the hospital was built in 2006, according to Mat-Su Regional spokesman Alan Craft. Tagging onto the third-floor expansion, in an unfinished shell built when the hospital was, allowed the more rapid addition of the behavioral health beds, hospital officials say. The planned behavioral health wing wasn’t funded with government money or grants, Craft said. “If we didn’t believe in this, we wouldn’t have invested in it,” he said. 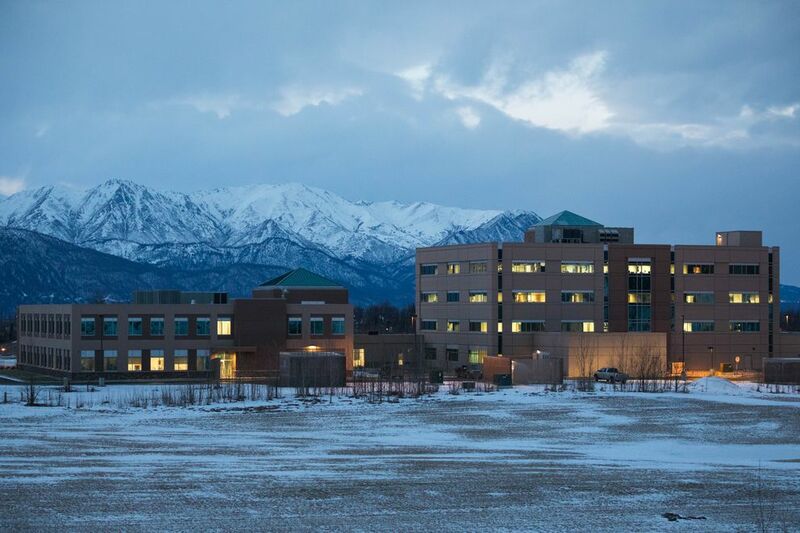 Mat-Su Regional is owned by Tennessee-based Community Health Systems, a publicly traded company that owns, operates or leases 110 hospitals in 19 states. The company has struggled with debt and sold numerous hospitals last year, according to a report from the HealthLeaders news site. Work on the new mental health unit is expected to start next month and wrap up by August, said Allison, the behavioral health director. The hospital is also hiring numerous staffers, from nurses and behavioral health technicians to clinicians and psychiatrists. Once it’s done, adult patients who show up in the ER with acute behavioral health needs can be admitted and brought up to the third-floor unit via a secure elevator. Patients will come via direct referrals from providers, admissions made in the emergency department, and involuntary or court-ordered admissions. The unit will offer group therapy, family meetings and case management. “We really believe that it will be filled near capacity right away,” said Jarom Schmidt, the hospital’s chief operating officer. The new unit won’t provide set-aside beds for drug or alcohol detox, Allison said, but will see patients with “dual diagnosis” behavioral health issues that may include drug or alcohol substance use disorders. Opiate-related issues surface in about two-thirds of the patients exhibiting drug withdrawal or overdose symptoms in the emergency department, according to Karl Soderstrom, the founder and executive director of True North Recovery Inc. The nonprofit behavioral health treatment program with peer support and sober living components provides consultation and services in the emergency department for drug- or alcohol-related problems. True North does 30 to 45 consults at the hospital a month, said Soderstrom, who credits the hospital’s recognition of the need for mental health and substance abuse services in an acute-care setting. A Mat-Su Regional physicians group even donated more than $10,000 for furniture at True North. “The culture really is shifting,” he said. Mental health advocates in Mat-Su say the need continues for as many psych beds as possible. The hospital "didn’t simply just pluck” the original 36-bed number from the air, notes Munson at Mat-Su Health Services. That number reflected “solid research projections” based on population and growth. “While the 16 beds are going to be of enormous help and will make a big dent in it and add a needed resource, it’s not going to be very long in the future before those 16 beds are not meeting the need,” he said. It’s still possible that the hospital could build the stand-alone unit, officials say. But they’re planning to wait to see how the situation unfolds at API, and what level of demand they see at the smaller unit. “It’s not off the table,” Craft said. If they opt to proceed, the hospital will need a new certificate of need through a state program that makes sure expanded health-care services are justified in communities. The state approved a certificate for the larger behavioral health facility in November 2017, but hospital officials last September filed a modification request for fewer beds on the third floor “so that these desperately needed services will be available up to a year and a half earlier than previously anticipated.” The hospital also asked for concurrent approval of the new general medical-surgical beds. Alaska Health and Social Services Commissioner Adam Crum approved the modification in late December. The state rejected the hospital methodology used to justify the need for the new general beds, but approved them anyway given the area’s growth and lack of another provider offering similar services. The state certificate of need program made it clear that the hospital would need to go back through the entire process to bring more psych beds online, said program coordinator Alexandria Hicks. That process takes at least 3 1/2 months. “There is no guarantee that they would get those beds, and or someone else could apply for them," Hicks said. There’s no indication other hospitals in Southcentral would step in. A spokesman for Providence Health & Services Alaska, which operates the outpatient Providence Medical Group Mat-Su Behavioral Health Clinic in Palmer, said there are no plans to expand behavioral health services in Mat-Su. “It’s just kind of a desperate situation all around with these psych beds,” Hicks said.